As we enter Week 2 of earnings season, 30 S&P 500 companies, or 9% of earnings have reported, of which the most notable so far include four Financials and two Industrials reporting results last week, with only Wells Fargo missing EPS estimates. Among the earlier reported, JPMorgan beat on sales and EPS, topping expectations across most businesses; likewise, Delta Air Lines confirmed consumer strength, citing strong travel demand especially for premium tickets, and Fastenal's results were encouraging for Industrials. Yet despite the strong (early) start, Bank of America notes that bottom-up 1Q EPS fell a few cents last week (to $37.23 from $37.29), hurt by continued downward revisions to Energy and Industrials estimates. At this point in reporting Consensus expects 1Q EPS to be -2% YoY despite sales growth of 5%, largely due to an expected shrinkage in non-Financial net margins which are forecast to contract to 10.1% from 11.1% in 4Q. Results are weaker down market cap: small caps continue to see bigger cuts to 1Q expectations and fewer beats so far. Broken down by sector, the biggest EPS cuts have been to Energy, Industrials and Staples, while Industrials, Energy and Materials companies have seen the biggest revenue expectation cuts. 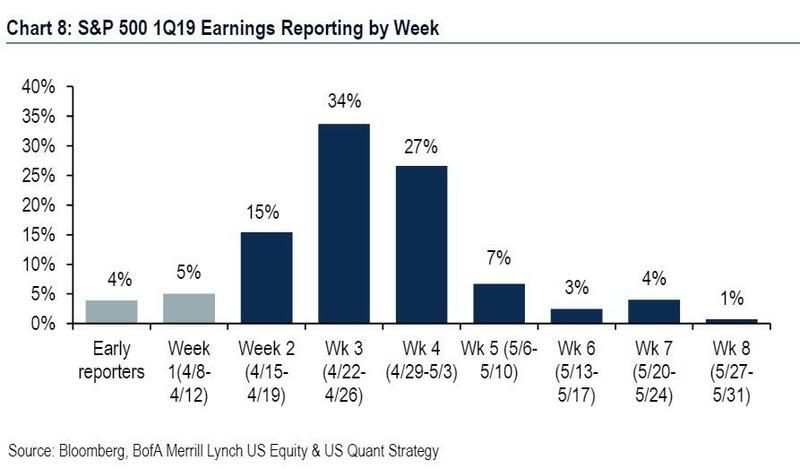 Of the handful of companies reporting so far, 73% have beaten on EPS, 10% higher than the same time last quarter and above the Week-1 average of 63%. And similar to last quarter at this time, 47% of companies have beaten on sales, with only 37% beating on both metrics, just below the Week 1 average of 43%. Despite the EPS weakness, consensus expects 1Q19 sales growth to top 5% YoY, the same as last quarter, with BofA estimating that FX was a 2.1% headwind to YoY growth (vs. a 1.4% headwind last quarter), the biggest FX drag since 4Q15 (Chart 4). Moves in the yuan and the euro relative to the US dollar were the biggest contributors to the FX drag. Excluding FX/oil impacts, constant-currency sales growth for the S&P 500 ex. Fins. & Energy is expected to actually accelerate to +8% YoY from +6% YoY last quarter (Chart 5), with pick-ups in growth for Staples, Financials, Health Care, Materials and Utilities. 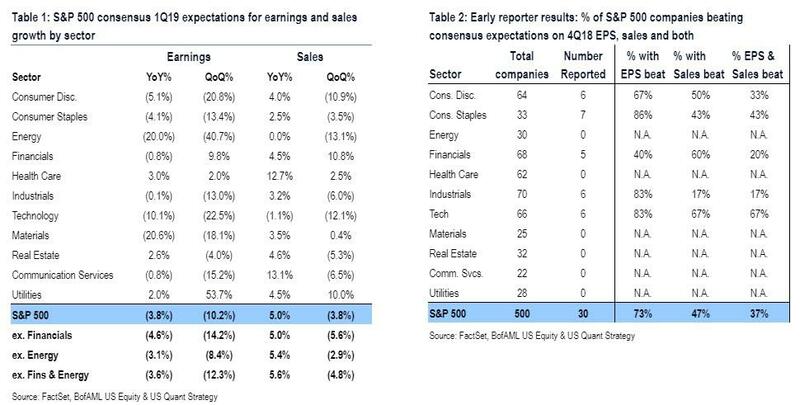 That said, it should not come as a surprise that Q1 earnings would be poor with even bullish analysts in recent weeks predicting an earnings contraction (although few going as far as Morgan Stanley in predicting a protracted earnings recession lasting through the end of the year). 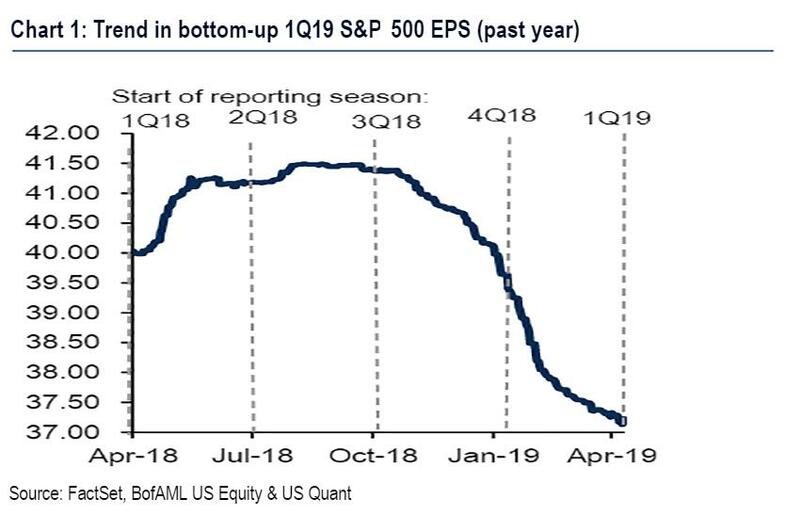 Here, Bank of America is bullishly inclined, and writes that given the steep 7% drop in consensus 1Q EPS YTD, the bank thinks that "estimates have sufficiently reset and see upside risk to results this quarter." Furthermore, the bank notes that in prior quarters following similarly-dramatic cuts, EPS beat in all instances by 3% on average (although Morgan Stanley is not confident we will get a similar performance this time). This quarter is shaping up in line, with reported earnings for the handful of reporters topping estimates by 2% in aggregate so far. Ultimately, Bank of America predicts, that results should beat expectations given better recent macro data and bottoming revision trends. That said, guidance is all that matters as we noted recently, and any improvement in the management guidance ratio, which had deteriorated in 1Q (as it typically does) could drive new highs for the S&P 500 (while any sharp deterioration may result in a "bad news is good news" outcome, and also driving new highs). Finally, looking at the current week, the docket remains relatively light, with another 15% of earnings reporting, mostly from Financials, Health Care and Industrials. Given the amount of late 2018/early 2019 de-risking and the overall "bunker" mentality of US funds, Bank of America predicts that "surprises in unloved cyclicals could see bigger reactions."